Heavy with silver, your 1950 Franklin half dollar value is $5.63 each. However this is just the minimum to how much it is worth. By looking closely at your coin there is a fine, but distinct difference, from one that is average circulated in condition and one nicer in appearance, and the type awarded a higher value. Minimal-to-total absence of wear on a 1950 half dollar now qualifies it as a collectible. See further down the page, images showing the different stages of wear highlight what is necessary to realizing this higher value. Also notable, is the difference in 1950 half dollar value if your coin was minted at the Denver mint. Currently in the "uncirculated" grade Denver mint coins are priced slightly higher. If your coin was set aside long ago by a collector it has possibilities. Pictured is a highly desirable 1950 Franklin half. Due to the exceptional "album" toning it was likely once part of an old time collection. Deep toning along the rims is the result of decades resting in an old style cardboard folder. Vibrant colors give this coin a certain eye appeal popular with collectors today. Mintmarks make a difference in the value of your 1950 half dollar. Only two mints, the main mint in Philadelphia and the branch mint in Denver struck halves in 1950. Denver placed a somewhat small "D" on the reverse just above the beam holding the Liberty bell. Have a close look at the coin pictured. It is the "proof" version of the 1950 Franklin half dollar. These were special minted and sold by the mint to collectors. Perfection was the goal. In all stages of the proof coinage process the Philadelphia mint took extra care to produce a flawless coin. Coining dies were kept polished as well as the coin blanks were carefully cleaned and polished. And, unlike regular coins, each proof Franklin half was struck twice to deeply impress the design. As the first year of the Franklin proof half and minted in low quantities, (just over 51,000) it has become one of the higher value coins in the series. Notable for their deep reflective mirror type fields and bold well defined details a collection of proof Franklin halves is quite specialized and impressive. Finding an example in top condition is a challenge however. When available, proof 1950 Franklin half dollar value is quite high. A recent example, the coin pictured was bid to $425 at a David Lawrence rare coin auction. If set aside long ago, carefully inspect your halves, one of these elite collectibles is perhaps waiting for discovery. Your half dollar is either valued as a collectible or as bullion silver, the difference is condition. Collectors "grade" the condition of coins for two reasons; one is to help decide if they want the coin for their collection. And the second, value. 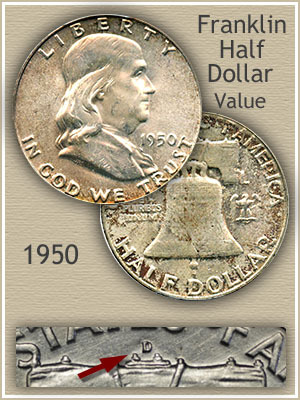 Use the example images and descriptions below to arrive at an accurate value of your half dollar. 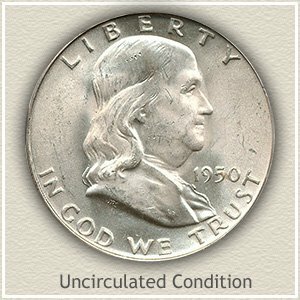 Uncirculated: Take your time here, 1950 Franklin half dollar value is highest if in "uncirculated" condition. No wear to the surface defines the uncirculated grade. When first minted all coins display mint luster, this luster radiates in bands when the coin is tilted. Also delicate, luster it is the first to wear and show signs of use. Examine both the lower edge of the Liberty bell and the cheek area below Franklin's eye for any breaks in luster. 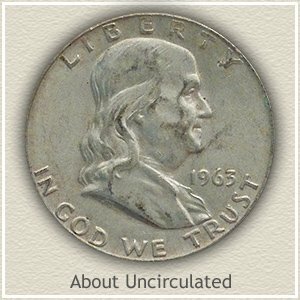 About Uncirculated: Light wear to a coin's surface is graded as "about uncirculated" in condition. The importance is on - light. To qualify your coin must show the majority of its original mint luster, and the light wear is confined to just the high points. Franklin's jaw and his cheeks below and in front of his mouth are the first to show signs of wear. However a certain roundness to these areas needs to remain. Additionally, small patches of luster are often missing in the fields of the coin both in front of and behind Franklin. 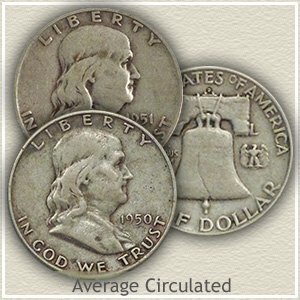 Average Circulated: Today's collectors are only willing to place a high value on a 1950 Franklin half dollar if it's in the top grades. If enough wear has developed to eliminate all mint luster and obscure fine details they are worth silver bullion value and not prized as a collectible. Hair detail across the top of Franklin's head was never strong to begin with and if missing your coin is below the about circulated grade and valued as average circulated. 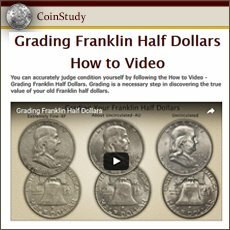 Return to Coin Values Discovery... find 1950 Franklin half dollar value and... a complete index of image and text links to all US Coin series, from Cents to Gold. Old coins retain a strong collector following. Walking Liberty halves are an example highlighing the value of silver in old coins. Additiionally, within each series are rare date and mintmark combinations with even greater demand. Revisit your box of old coins, today's value charts show a steady increase. Franklin half dollars are highly valued not only for their silver content, currently $5.63 per coin, but are now becoming a sought after collectible. 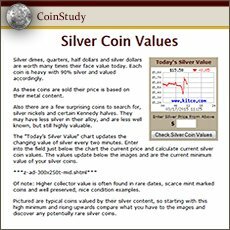 All dates and mints listed on the chart, with links to specialized silver value pages.